Geriatric Care Services Market size is set to exceed USD 1,490.5 billion by 2024; according to a new research study published by Global Market Insights, Inc. Rising geriatric population base coupled with growing number of chronic diseases and increasing number of long term care services is driving the geriatric care services market size over the forecast timeframe. As per the UN estimates, elderly population was over 800 million in 2012, projected to surpass 2,000 billion by 2050, hence propelling the global market growth. Additionally, the increase in elderly population coupled with presence of various home care services, day care facilities and geriatric care establishments are likely to further enhance the geriatric care services market growth. Moreover, growing geriatric people who are susceptible to several medical complications such as neurological, respiratory, orthopedic and cardiovascular diseases coupled with increase in the advancement of technology such as the development of specialty robots skilled for assisting old people in carrying out day-to-day operations is anticipated to drive the geriatric care services market. Growing elderly population living on their own and increasing demand for effective geriatric care services will fuel business growth over the forecast period. High cost associated with geriatric care services will be a market impeding factor. In addition, lack of geriatric services in developing countries will decrease the demand, thus hindering the market growth. Institutional care market was valued around USD 545,328.5 million in the year 2017. Presence of various nursing homes, hospitals, assisted living centers, and independent senior living centers for medical care of elderly patients is boosting the business growth in the forthcoming years. Home care market is estimated to grow at a CAGR of 9.2% over the projection period. Several advantages offered by home care services such as lower risk of rehospitalization, greater convenience, better quality of life, and lower medical bills will boost the care service demand. Additionally, some of the best home care centers offer enrichment programs for elderly patients that are tailored to each person, accordingly, hence propelling the industry growth in the forthcoming years. Public service provider in geriatric care services market was valued around USD 616,025.4 million in the year 2017. The growing demand to cover eligible elderly population from bearing the direct burden of most health care expenditure is driving the market growth. Furthermore, in western countries like U.S., Germany, and France, governments are under increasing pressure to ensure that their citizens have access to superior healthcare services at a reasonable cost, that will in turn accentuate the market demand for public service providers. The age category of 65-70 years in geriatric care services market is projected to grow at a considerable CAGR of 9.9% over the forecast timeframe. Increasing sedentary lifestyle, alcohol consumption and smoking is making way for an array of chronic diseases, fueling the market growth in the forthcoming years. In addition, people in the age category of 65-70 years are extremely prone to infectious diseases as well as suffer from serious orthopedic issues, that will boost the market growth. U.S. geriatric care services market is estimated to grow at robust CAGR of 7.6% during the projection period. Increase in number of geriatric population affected with chronic diseases, recent technological advancements in geriatric care services and high healthcare expenditure in U.S. will result in largest market share in the global market. 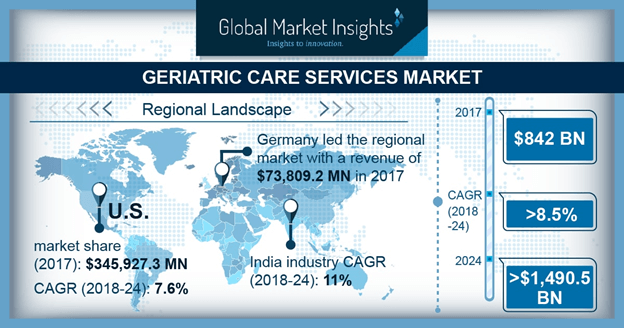 Germany dominated the Europe geriatric care services market and was valued around USD 73,809.2 million in the year 2017. Increasing demand of attractive and cost-saving insurance plans for the elderly population is fueling the market growth in Germany. Additionally, increase in healthcare expenditure for the elderly people in Germany has led to growth in effective reimbursement policies, hence driving the business growth in the country. Some of the leading players in the geriatric care services market include Brookdale Senior Living Inc., Extendicare Inc., Gentiva Health services, Inc., Kindred Healthcare Inc., Senior Care Centers of America, Sunrise Senior Living Inc., Genesis Healthcare Corp., Home Instead Senior Care Inc., and GGNSC Holdings, LLC. These companies opt for strategic decisions such as mergers, acquisitions, and partnerships in order to increase their efficiency and sustain in the market.